When Grantham vet Denis Oliver was called to treat a dog at Barkston Heath airfield on December 18, 1944, he expected it to be one of his usual guard dog visits. Instead, his patient was one of America's most famous canine dogs of war - the badly burned Dalmatian known as Major Jerry. "I remember the air of gloom about the place, you would not have thought it was the week before Christmas. "There was a really depressed atmosphere and they told me that an extremely eminent pilot had been killed in a crash. I didn't ask any questions - it was wartime - one didn't." What greeted Mr Oliver was a deeply shocked and badly injured dog, Col Frederick's beloved flying companion. "He was burned all over. I knew he was a gonner. But I didn't dare suggest that I put him down. I gave him some morphine and dressed his wounds. I left, but I never forgot it. "They showed me a book of the dog's press cuttings from American magazines and news journals. He was a celebrity. 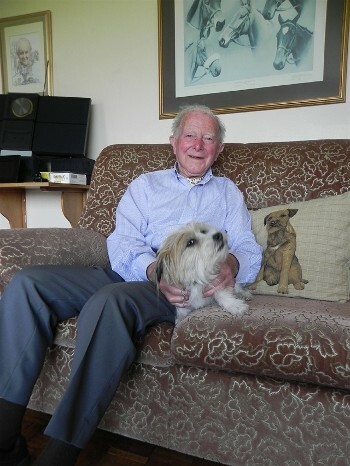 "I gather that he was actually thrown clear but ran back into the burning aircraft in search of his master, who was trapped in the front"
Mr Oliver founded the Avenue Road veterinary practice in 1944 and found himself in the thick of the action. "I looked after the RAF and Army guard dogs. Some of the lads used me as a bit of an excuse when they went to the pictures in Grantham. They would bring in a bunch of dogs, tie them to the operating table and slip off to one of the picture houses. It went down as a trip to the vet!" The surgery building had already been hit by one of a stick of four bombs, probably destined for either the former BMARC munitions factory or Aveling Barford. "One fell on what is now the council gardens, and the second took out the stables and kennels at 35 Avenue Road. A lot of dogs were buried but they all got out alive. The other two came down where the multi-storey car park now stands." He was awarded the OBE for services to veterinary science, was a member and Past Master of the Worshipful College of Farriers, President of the Shire Horse Society and for 24 years he was the Chief Veterinary Officer of the Royal Agricultural Show.